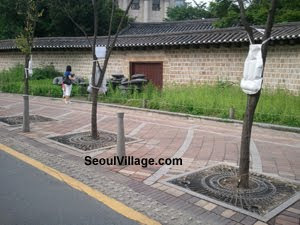 When I first noticed those white plastic bags hanging from the trees along Deoksugung walls, I thought a few angry kids had thrown their diapers around in a sudden potty training strike... or more likely, the nearby museum of art had excreted some disruptive installation from the other side of Deoksugung-gil. But from a closer range, one can see the tubes and syringes reaching for the feet of the trees. So the bags were just containers for pest treatments... the most spectacular so far (I'm more used to the small bottles attached to the trunks). I've always been amazed by the sharp contrast between the cold and warm seasons and how quickly green comes back with a vengeance, along with all sorts of insects. After one of the coldest Januaries on record, we're enjoying a more decent May, and in a remarkable parallel, humans and bugs have started swarming in their respective outdoor hot spots.